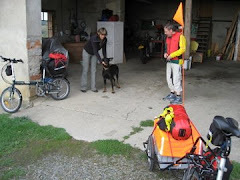 Comments about cycling, and cycle and bicycle touring in Europe - routes, carriage of bicycles by public transport, hotels, hostels, camp sites, bicycle rental, bicycle hire, life in Viernheim, Germany and living in the time of peak oil. We have a problem at present. We want to finish our new e-book version of "Rhine 2"covering the Rhine from Basel to Rotterdam. Our printed version is now both out of date and print, but does still attract orders via older versions of the website (www.bergstrassebikebooks.com) which can be found on mirror sites in the Internet. We do have the upstream version "Following the Rhine gently upstream Rotterdam to Basel, a Cycle Tourist’s Guide" available from Smashwords and Amazon, which will be updated this winter. We could persuade Batavus or Gazelle to lend us a bike each for the publicity. We could buy a couple of Dutch e-bikes from the Gazelle Outlet Shop. These bikes in the Netherlands are cheaper than in Germany. The problem then is our local bike shop owner would probably scrag us and rightly so. Everything runs like it's just been oiled. "Cycling the Riesling Route" cycling the Rhine from Strasbourg to Koblenz, Moselle to Nancy and the Canal de la Marne au Rhin to Strasbourg.